The WAVEFORM CX is a wide band, carrier-grade, fully programmable, point-to-point MW radio system designed to meet high capacity transmission needs. The system can be deployed as 2+0 aggregate (XPIC) link or 1+1 hot standby (HSB/SD/FD) link and in basic configuration as non-redundant (1+0/ “Dual end station”) link. This unified and flexible system platform supports pure IP-based applications and allows building of Hybrid systems alike. That means that the user can scale the pure IP radio system with additional interfaces (e.g. DVB-ASI ports for HD video broadcasting and E1/T1 ports for TDM applications) when the service is requested at the optimal costs. Via software keys the user can easily upgrade the capacity to full throughput and implement additional functionality (IEEE 1588 clock synchronization, AES Encryption,..) any time in the future without changing the hardware. 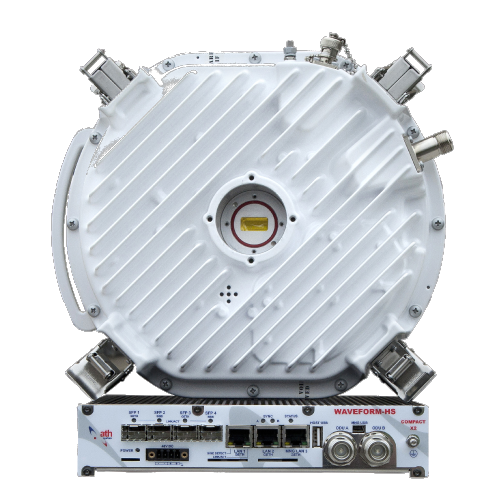 The system is available with 56/60MHz channels across the whole frequency spectrum from 6 through 42 GHz and with 80 MHz channels in 18 and 11 GHz frequency bands. Other frequencies will come. Professional parabolic antennas in standard diameters and common frequency bands are available to build the complete microwave systems and meet individual application needs. Complete sort of accessories such as AC/DC Power supplies, cables, surge arrestors, etc. are available to provide the turn-key system solution for our customers.